27 January 2016. Gene editing techniques repaired a defective gene in stem cells from an individual with retinitis pigmentosa, an inherited eye disease. The team from Columbia University and University of Iowa reported its findings in today’s (27 January) issue of Scientific Reports. Retinitis pigmentosa is a family of genetic eye disorders that result in damage to the retina, specifically breakdown and failure of photoreceptor cells in the retina leading to progressive vision loss. The disease takes several forms, but it generally causes failure of photoreceptor cells detecting light and color, and helping eyes see in dim light. As a result, people with retinitis pigmentosa may experience symptoms such as night blindness and loss of peripheral vision. The organization Research to Prevent Blindness says some 100,000 people in the U.S. have retinitis pigmentosa. The researchers led by ophthalmology professors Stephen Tsang at Columbia and Vinit Mahajan at Iowa, are seeking therapies for retinitis pigmentosa that address the underlying causes rather than easing symptoms. Treating retinitis pigmentosa is difficult, even with gene therapies, because of a single defect responsible for the disorder and tight configuration of related base pairs in the genome. Thus, an editing technique such as CRISPR, with its ability to make precise edits in genes, was considered a good candidate to meet this objective. 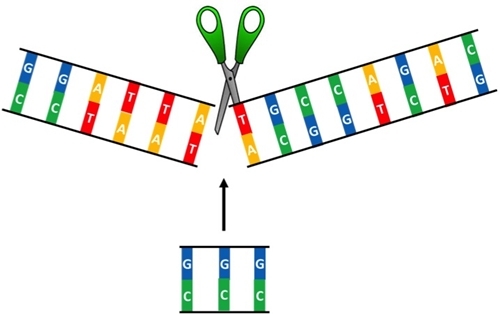 CRISPR — short for clustered, regularly interspaced short palindromic repeats — is a technology based on bacterial defense mechanisms that use RNA to identify and monitor precise locations in DNA. The actual editing of genomes with CRISPR uses an enzyme known as CRISPR-associated protein 9 or Cas9. With this approach to CRISPR, RNA molecules guide Cas9 proteins to specific genes needing repair, making it possible to address root causes of retinitis pigmentosa and other inherited diseases. Tsang, Mahajan and colleagues in this study applied CRISPR to adult stem cells from the skin of a person with X-linked retinitis pigmentosa, an aggressive form of the disease. The team aimed specifically at the retinitis pigmentosa GTPase regulator or RPGR gene that when healthy provides instructions for proteins enabling normal vision, but mutates in people with the disorder. Conversion of the patient’s stem cells in this study produced retinal cells reflecting that mutation. With CRISPR, however, the researchers say they can correct the faulty RPGR gene in the patient’s stem cells. The team was able to transform 13 percent of the gene-edited stem cells into retinal cells with corrected RPGR sequences. Since the study was designed only to test the technique’s feasibility, the healthy retinal cells produced were not transplanted into the patient. The authors note that deriving retinal cells from an individual’s own stem cells removes the danger of inducing an immune response. In addition, the use of adult stem cells reduces ethical concerns of some people bothered by transforming embryonic stem cells. The Columbia-Iowa team is looking into refinements of its technique, particularly any unintended genetic changes that may be induced as a result. While the authors claim no financial conflicts in the research, a number of companies spun-off from research labs at other universities are developing therapies for inherited diseases using CRISPR.